Successful diamond sawing is both an art & science. Requiring the proper understanding of how to use speeds and feed rates, coolants, flanges, & material holding fixtures to maximize cutting efficiency, diamond blade and cut quality. While this understanding is best gained through experience, even new diamond blade users can quickly become proficient by learning and applying some basic principles of diamond sawing. We are here to help you get the most out of your diamond sawing operation. BELOW IS A GUIDE OF MOST COMMON DIAMOND SAWING PROBLEMS & SOLUTIONS ON HOW TO RESOLVE THEM. If you have a problem than is not addressed by this guide, have a question, need further guidance or assistance please contact us by email, phone, or fax. For urgent support, you can contact us at: Phone: (661) 257-2288. Our experienced engineers will provide valuable suggestions on how to improve you diamond sawing operation. We encourage you to provide as much information as possible on your application problem occurred, and periodically update us on your diamond blade progress. We also highly encourage you to check the SUPPORT part of our web site. This will answer most questions you may have. Diamond Blade Life & Overall Performance will vary with material hardness, density, thickness, & cutting depth. 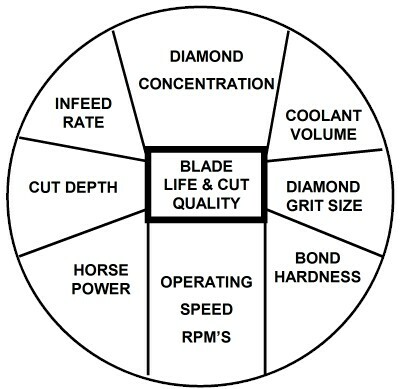 Few other factors that play a role in diamond blade life & performance include: RPM's (cutting speed), Feed Rate, Geometry (shape) of Material, Coolant being Used, Coolant feed rate and Direction. Cutting Equipment, Material Clamping Method & experience of operator. While there is now way of accurately predicting Life of your diamond blade. It can be optimized by following Principals of Proper Diamond Blade / Tool Usage. There may also be some experimenting, as well as trial & error involved in the part of the end user. Highly experienced diamond blade users may find some variations in diamond blade life or performance even when working on same material & application. While this phenomena is not too common, it does occur. The machining environment around us is constantly changing. A slight change or variation in any variable can have significant impact on your diamond sawing results. Material being cut can vary in composition or density even when coming from same manufacturer or source. Slight change in coolant feed rate, coolant direction, RPM's, even the way the material is held in place can make the difference. Frequently the cause of the problem may not be obvious and may take as much as several failed attempts to surface. When encountering problems or variation in diamond blade performance. Few stop to think about or carefully examine their cutting process. Many users immediately suspect quality of the diamond blade and are quick in labeling the drill "Defective" or "Poor Quality". This is very rarely the case. Usually in over 90% of these cases the diamond blade itself was not at fault. Most Respectable & Experienced Diamond Blade Manufactures have rigid quality control and inspection processes set in place. Controlling everything from raw material input, output, to final inspection. As well as field test blades randomly. What a number of diamond blade users don't realize the technical aspects & delicate nature of diamond sawing/machining process. What is important to understand is that almost all diamond blade users, regardless of experience or technical background will make some type of an unintended operator error while at some point in their career. With this in mind, UKAM Industrial Superhard Tools has assembled a list of most common diamond blade operator errors made by users in most industries & applications. Looking through this guide will help you RESOLVE MOST COMMON DIFFICULTIES you may have in using your diamond blades, as well as AVOID MOST COMMON PROBLEMS in the first place. Small flange diameter is the largest cause of blade vibration. Make sure that your material is securely held in place and does not move while being cut. Check to see if sufficient amount of coolant is reaching the cutting zone. Cut into dressing stock 10 to 20 times. Or as much as necessary, until blade starts near same speed as when it was new. Improper blade specification. Diamond Concentration, Mesh Size, and Bond Hardness is inappropriate for material being cut. Use different blade with right bond type, hardness, concentration and grit size for material being cut. Contact us for recommendation. Make sure the size of flanges on your cutting machine are appropriate for use with blade diameter and thickness you are using. Make sure the exposure of blade is appropriate for size and dimensions of material you are cutting. Increase size of your saw flanges by using diamond wheel stiffeners. If blade is dished, send to us to flatten or purchase new diamond wheel.